MONTREAL (Sporting Alert) — Red Bull star driver Sebastian Vettel will start in pole position for Sunday’s Canadian F1 Grand Prix after beating out Mercedes’ Lewis Hamilton during the qualifying session. Sunday, 9 June: Coverage on BBC One Also at 2:00 PM ET. Vettel’s effort saw Red Bull ending Mercedes’ recent hold of pole position and he will be hoping to take full advantage. The reigning triple world champion, who has never won in Canada, covered the session in 1:25.425, just 0.087 seconds ahead of Hamilton. 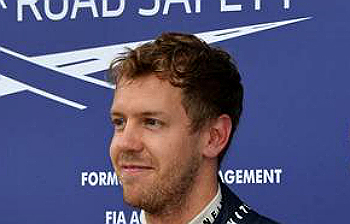 “It was very tricky, especially as you never knew what conditions it would be next time you were out,” said Vettel. He added: “It was very tight with Lewis – in the end everyone was improving in the first two sectors but the last two corners did not allow anyone to go quicker. However, the standout performance was from Williams’ Valtteri Bottas, who after going fourth in the first part of qualifying, fourth in the second, improved to a shocking third in the wet conditions, marking the first time this year that a Williams driver managed to make it into the top 10. Williams have also failed to score point this season. “It means a lot. It has been a difficult first six races for us, so this will be a nice boost for the team. We really got everything right today,” said Bottas. Meanwhile Mercedes’ Nico Rosberg, who won in a dominating performance at the Monaco Grand Prix and Red Bull’s Mark Webber completed the top five. Rosberg covered 78 laps in Monaco in 2:17:52.056. Fernando Alonso of Ferrari, Daniel Ricciardo from Toro Rosso and Lotus’ Kimi Raikkonen are also in the mix, following the third qualifying session. Sebastian Vettel and Fernando Alonso have both won twice already this season. Pos Driver Team Time diff.